I am so excited to announce that Poema now has a store front. The Cottage Collective is open. It’s an adorable house in The Green Elephant Village. Six other women and myself have moved our stores to 509 N. Lorraine. These women are extremely talented and have amazing handcrafted items and vintage finds. The Cottage Collective offers a unique shopping experience from repurposed furniture, vintage accessories for the home, hand sewn items for your home and baby and of course polymer clay jewelry. It is quickly becoming the place to shop in Wichita. Poema offers something special for everyone. You will find one of a kind handcrafted jewelry pieces that are as unique as the person wearing it. Polymer clay offers and endless amount of possibilities and a wide array of colors that are pleasing to the eye. Not only will you find necklaces, pendants, rings and earrings at Poema. New to Poema is our all natural candle line. 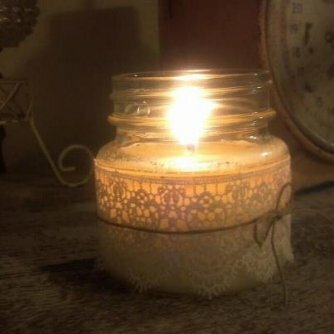 Each candle is made from soy, a USA renewable resource. All of our scrumptious fragrances are phtalate free so you can enjoy the wonderful fragrance without the health concerns for your family. Stay tuned for our upcoming healthier and more natural bath and body line. Just in time for the Christmas shopping season. The best inspiration for what I create is found in natural stones. I enjoy the process of duplicating the beautiful colors and texture. The organic look and feel without the expense and weight of the stone is appealing. With the rich colors available the possibilities are endless.